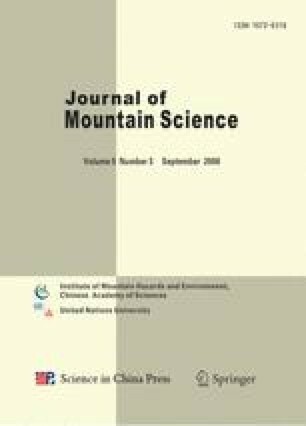 In order to examine the effect of the Zagros Mountains on precipitation, first, the annual and seasonal rainfall indices (rain days frequency, rain amount, daily rainfall intensity, and heavy rains) from 43 stations in 1995 ∼ 2004 between the 30° N to 35° N parallels over the mountain range were analyzed. Second, the effect of the Zagros Mountains was studied through the computation of the spatial correlations between the precipitation parameters and the topographic indices (station site elevation, station mean elevation within a radius of 2.5 km, mean elevation of 9 blocks along each of the eight Cartesian directions, and the elevation differences of these 9 blocks from the station mean elevation). The results showed that in the cold season the maximal rainfall occurs on the upper range of west slope, while in warm season it spreads over the study area. The correlations between precipitation and elevation indices were positive on the north of the stations and negative on the south of the stations, that is, the higher elevations of the stations to the north force the uplifting of the moist air masses and increase rainfall at the stations, while the lower elevations to their south lead the movement of the moist air masses to the stations. This is due to the fact that these stations or slopes are exposed to the moist air masses coming from the Mediterranean Sea and the Persian Gulf. The heavy rain days and the summer sporadic rain events do not show significant correlations with the topographic indices. The findings indicate that the Zagros Mountains intensify the cold period frontal rains especially over the west slope and block the moist air masses from entering the interior parts of the country. Moreover, these mountains play a secondary role in creating rain days. But they are very important in the production of precipitation in the area. Therefore, their absence will decrease the amount of rainfall to their west and, in return, expand the dry climates of their west and east.